Let me go back to what we started with, which I shared with you last week. It's a pretty small space tucked into the corner of our master bathroom, and I've always felt like the existing layout didn't make the most of the small space. We decided to switch up the layout to make better use of the taller wall, which had a lot of vertical space because of the pitched ceiling. 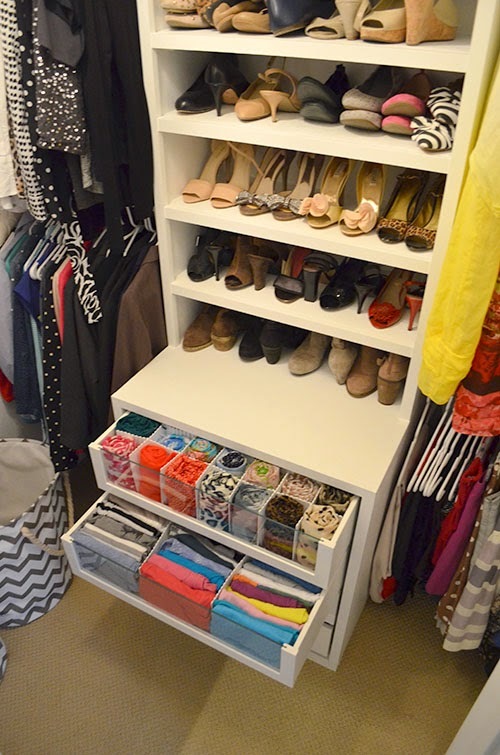 I asked the husband to build me a giant shoe shelf (every girl's dream!) and some drawers so that I could get rid of the cheap plastic storage containers. 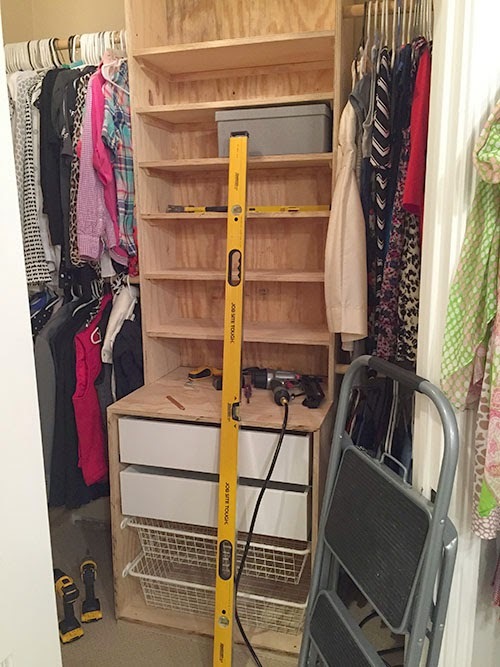 He used 3/4" sanded plywood to build the box for the drawers and the floor-to-ceiling shoe shelves. 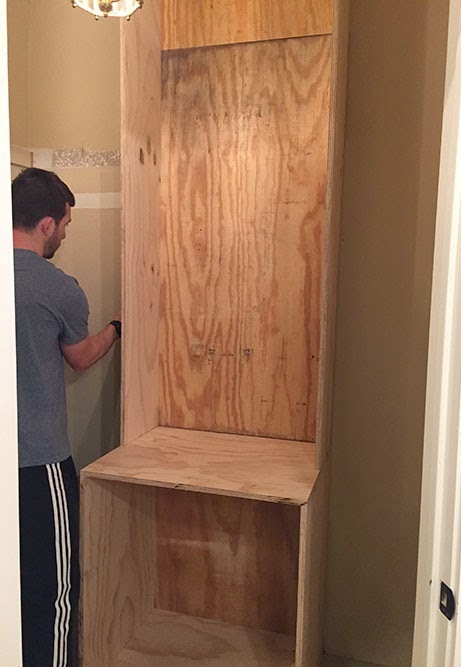 Just like he did with his own custom closet wall that he built in our master bedroom, he used Ikea drawers as his basis for the size of the cabinet. 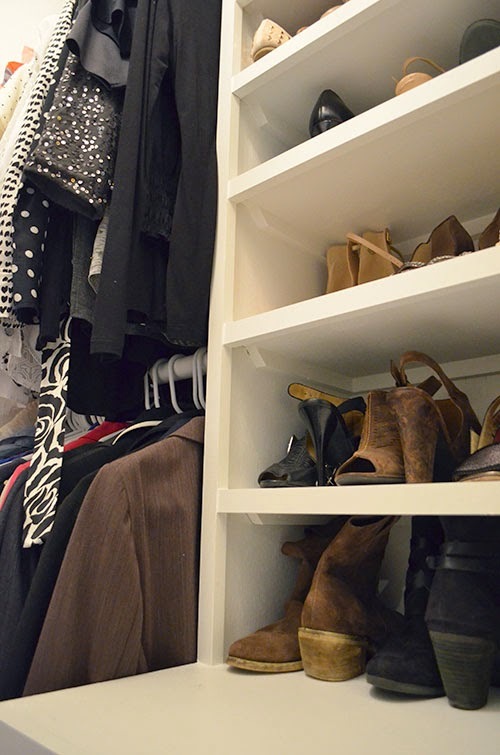 The bottom three shelves have 8 inches of height to house my tallest heels and boots, and the rest have 6" height for the normal sized shoes like sneakers, flats and sandals. 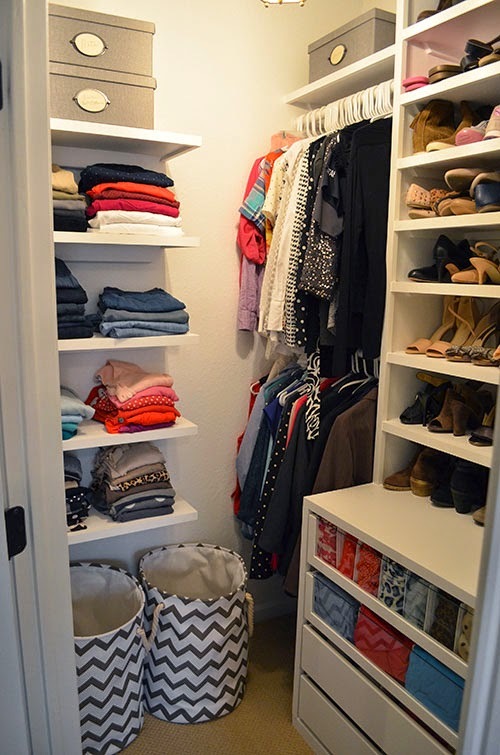 We actually started out with two plain drawers and two wire baskets (both of which are built for the Pax closet system), but we quickly decided it would look better if we replaced the baskets with regular drawers. When we went back to Ikea for more drawers, they were completely sold out. 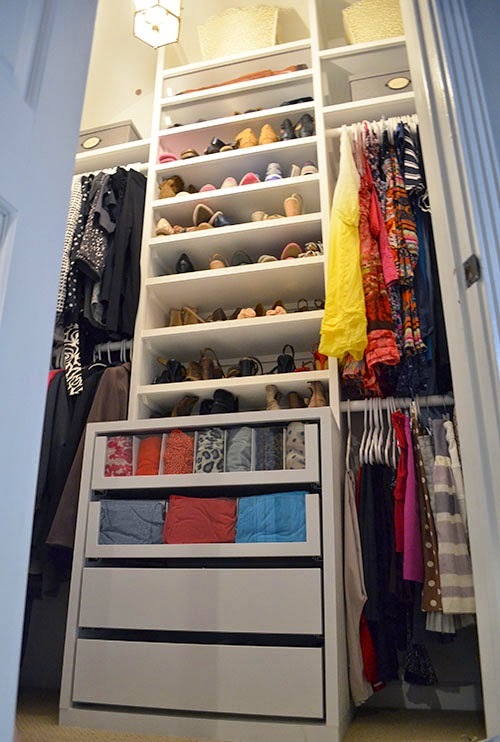 So lucky me, I got upgrade to the glass-front drawers! Ooh la la. 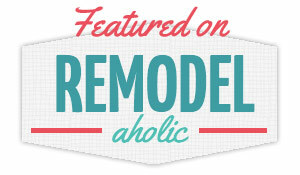 To finish off the cabinet, he used 1" strips of cabinet grade select pine to trim the cabinet edges and shelves. It made the piece look more more polished. Here's a good view of the structure he used to support each shoe shelf. We painted the cabinets Pure White by Sherwin Williams to match the rest of the trim and cabinetry in our house, including the master bathroom cabinets right outside the closet. We painted the walls the same color just to keep this small space light and bright. 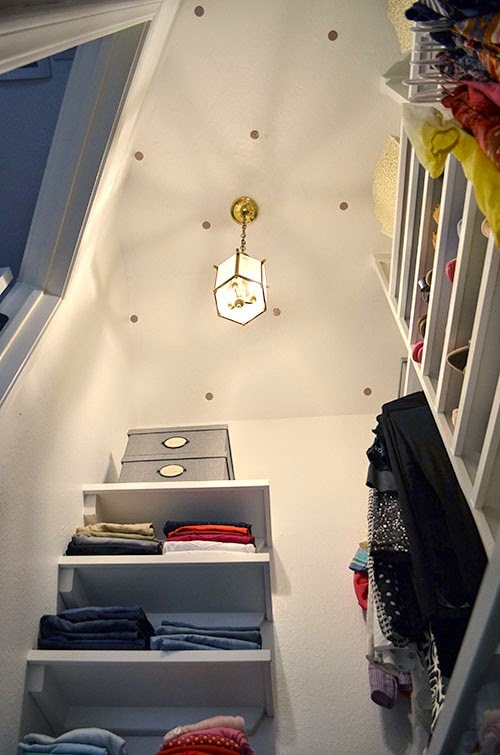 I decided the best way to make use of the other corner of the closet was to add floating shelves right above my laundry hampers. The husband built those for me in no time. 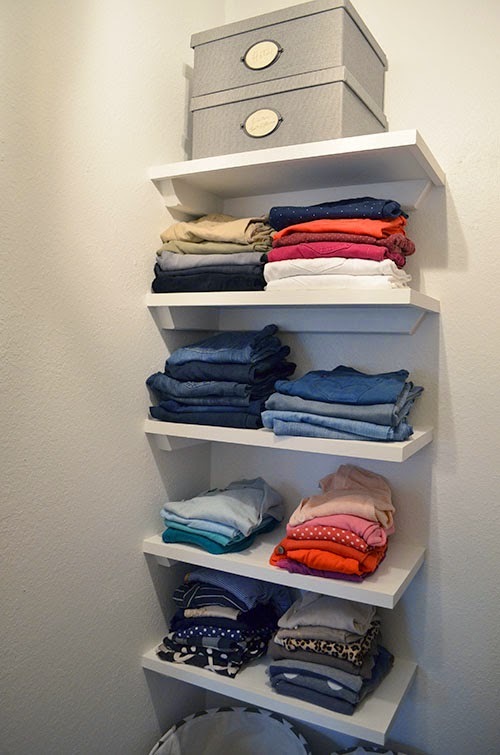 Because I lost some hanging space with this new layout, I decided not to hang my jeans or cardigans anymore, instead choosing to house them on these floating shelves. 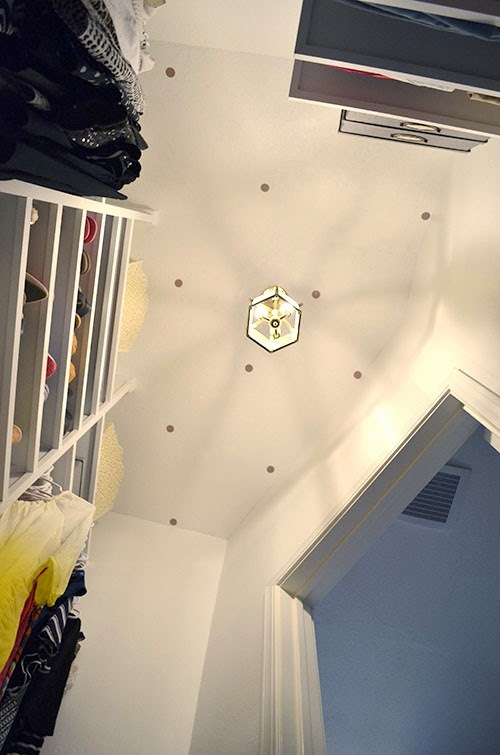 Yep, I put polka dots on the ceiling! I just felt like it was an opportunity to have a little fun with this tiny space, so I went for it. It was absolutely zero risk and very minimal effort because they are simply some wall decals I found on the sale shelf at Target for $5. I eventually want to switch out the light fixture, but I am going to be patient and wait for the perfect fixture to pop up at the thrift store. Those gray boxes are from the Kvarnvik line at Ikea. 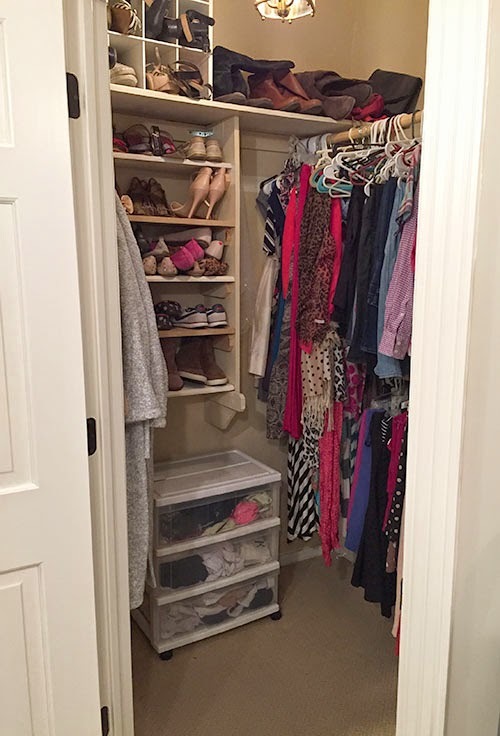 I'm using them to store seasonal things I don't wear all that often, like winter hats and glove, swimsuits, ugly Christmas sweaters, Halloween costumes, etc. 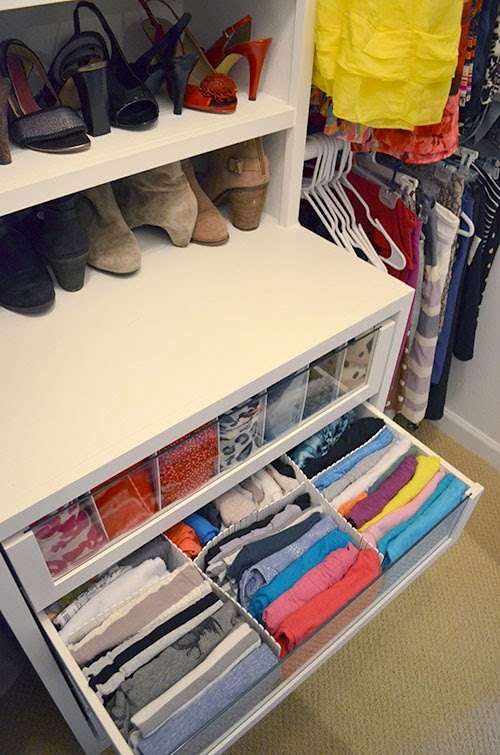 The only problem with the glass-front drawers is that whatever you put inside needs to look nice! 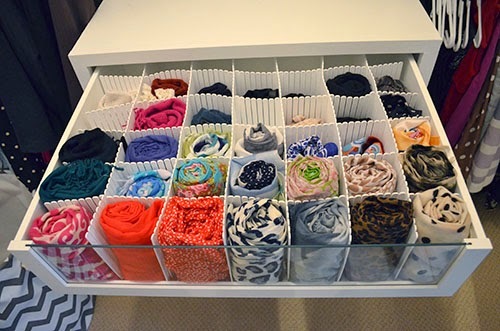 I decided to use the Hofta drawer dividers from Ikea (super affordable at $2.99 per 3-pack) to create the perfect drawer for all of my colorful scarves. 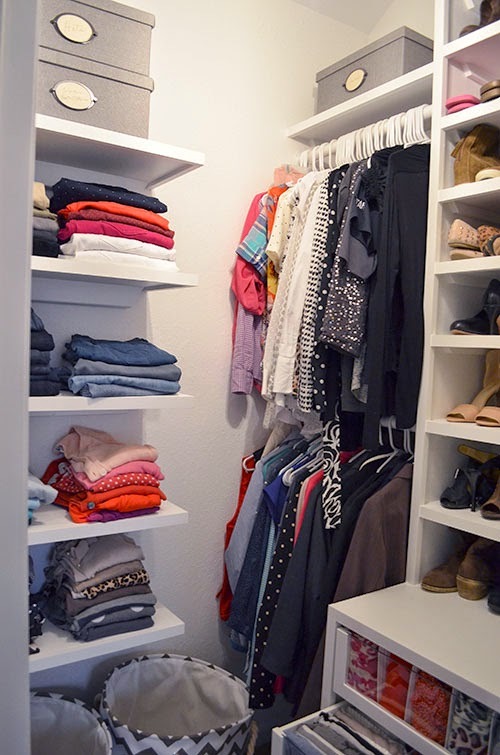 It took forever to put those drawer dividers together, but it was totally worth it. Then I used the drawer dividers to create a system for my extensive collection of t-shirts. The bottom two drawers can be as messy as I want since you can't see inside of them. Thank goodness, since I'm a naturally messy person. I can't be expected to keep every drawer this organized! It's just such a massive improvement over what I had before. I think we need some before/after comparisons to fully appreciate it, right? 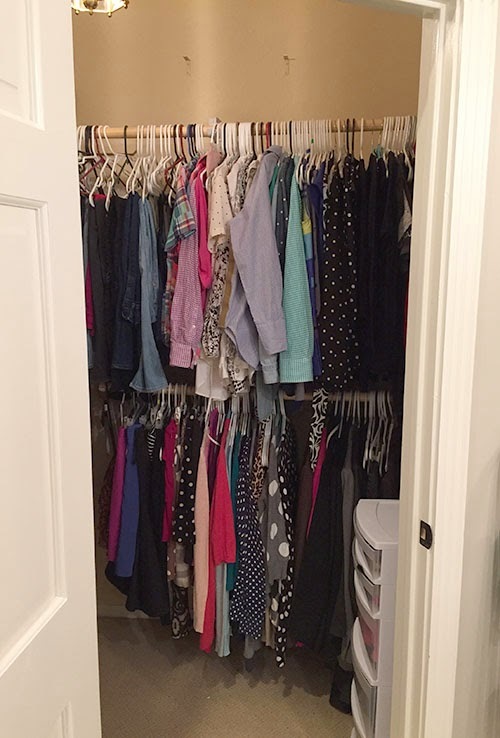 The most important thing is that I am now storing so much more clothing and other accessories in this closet than ever before, which was the whole goal of the project. The fact that it is way prettier is just an added bonus! 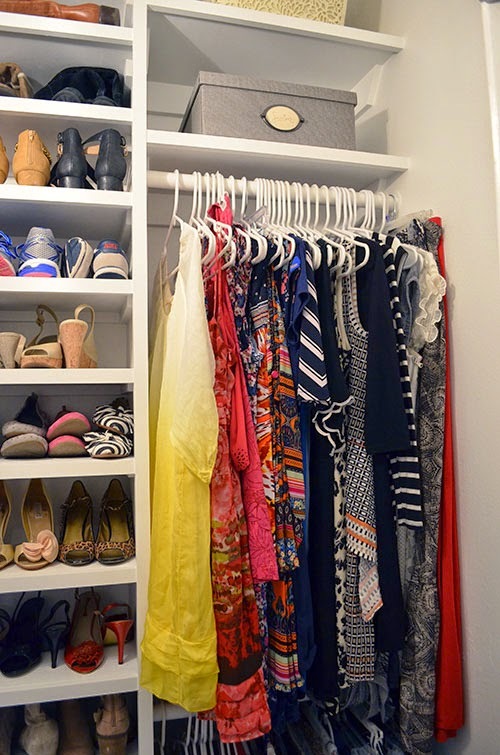 Ever girl loves a pretty closet. PS. Those hampers are from Walmart. Pretty cute, right? I've had them a couple of years but I think they still carry them.